Liquid Granite is a unique resurfacing system that leaves your bench tops without any of those unsightly joins. Bench tops are finished with a low sheen and with a unique textured laminate finish that will complement your entire kitchen or any service room throughout your home. With other resurfacing processes on the market, there are unexpected costly expenses that would not otherwise be taken into consideration. With other systems your benchtops would nearly always need to be removed. This means that your existing tiles would be damaged which would then need to be replaced, not forgetting the plumbers charges for removing and reinstalling your sink including your hot plate, not to mention electrics which greatly add to the cost of your kitchen restorations. These extras just on their own can run into many hundreds of dollars. 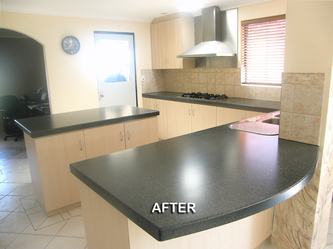 Our innovative resurfacing process is unique and very cost effective against all other known benchtop resurfacing systems. NO RETILING COSTS. NO PLUMBING COSTS. NO ELECTRICAL COSTS. 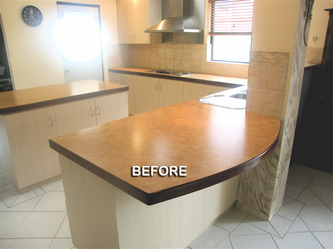 Every benchtop we resurface is covered by a "FIVE YEAR WARRANTY"
"Why not call us today to make an appointment for a free measure and quote"
Copyright: Liquid Granite 1998 - 2017. All rights reserved.